It's firmly in the mid-range of Panasonic's latest crop of 4K TVs, but this 40-incher's app-packed Firefox OS and its clean and colourful images make it a great value contender. "Don't like the way your TV looks today? So get out your screwdriver and change it!" It's not the TX-40DX600's tagline but it may as well be as it's the rather odd choice presented by this 40-inch LED-backlit LCD TV from Panasonic, which boasts one of the oddest desktop stands we've yet seen. Although it screws onto the bottom of the TV just like any other desktop stand would, once detached, you can turn it through 180 degrees, changing from an orientation with two small aluminium legs poking outwards and away from the TV screen to a second configuration sees those legs curving inwards. The final look is quite different depending on which option you go for, though happily either choice lends the 40DX600 a cute floating look. However, those legs are a little shiny, plasticky and lightweight, and they definitely look better than they feel. There's much more to this 40-incher than that "tailored design," though. Chief among the 40DX600's attractions to some will be is completely flat design. Thought the curved TV was a fashionable, desirable design icon? Think again – it's dead already, at least according to Panasonic. Ditto 3D, which has also been abandoned on the 40DX600. But a good bezel never goes out of style. The screen surround is reasonably slim, however, with a 5mm trim around the top and sides, and 18mm at the bottom, which tapers back. A follow-up to last year's excellent 40CX680B, the 40DX600 is Panasonic's best value 4K TV. 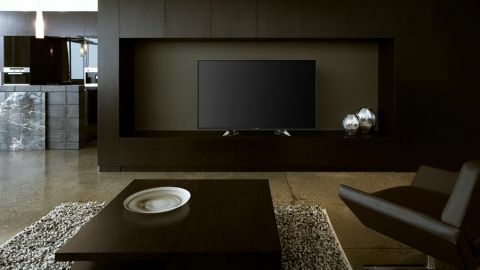 Four pegs down from Panasonic's flagship DX900 range –five, if you count its OLED – the DX600 series claims a 4K Edge LED-backlit panel with adaptive backlight dimming, 800Hz scanning and Quad Core PRO processor for super-quick smart TV navigation. It also has both a Firefox OS and a Freeview Play catch-up TV app, as do all Panasonic TVs for 2016, which lend it a smart, usable interface to watch Netflix or Amazon Prime Instant Video. Panasonic is the only TV manufacturer to use Mozilla's Firefox OS. And an OS it certainly is; to call it simply a smart TV interface ignores the fact that it represents a fully joined-up user interface where apps, inputs, external devices and catch-up TV are integrated as one ... however, we do have one small complaint: Panasonic insists on calling its user interface My Home Screen 2.0, a throwback to a now discarded OS from a couple of years ago. Firefox is a really easy user interface to understand and to use. The design is pure minimalism – three colourful, circular icons for live TV, apps and devices are presented against a photographic background that also includes a search option, and the current time. It's all simple, clean and vividly colourful, and looks like a phone interface, which sadly the Firefox OS will no longer become. Firefox OS on smart TVs is all about customisation, with constant opportunities to 'pin' anything to that main home screen. That could be the Netflix app, a USB input that you use a lot, or a favourite TV channel. Hold down the remote's home key for a few seconds and you find an intriguing Info Page, though it contains little save for some notifications panels, weather information and some of the random web video previews. However, you can also access a list of TV channels from its built-in digital tuner here, which supplies you access to a colourful list of Freeview HD channels. Panasonic is promising a big update to Firefox OS later in 2016. This so-called Firefox 2.0 is set to include a way of sending content from a phone to a Panasonic TV, though only if that phone is using the Firefox browser. What's more interesting about Firefox 2.0 is that it will deliver a way to play various apps on the TV solely through the TV's web browser without you having to search for, download or install specific apps to the 40DX600. But it looks likely to consist of some kind of Mozilla-curated content from around the web, including video, games, news and weather, so don't get too excited. Another great characteristic of the current Firefox OS is its plethora of smart TV apps. And while you'll find the streaming video staples here, there is one absolute standout: Freeview Play. A hub for the catch-up TV apps of UK broadcasters, the Freeview Play app contains simple icons for the BBC iPlayer, ITV, Channel 4 and Five, with additional links to the BBC's News and Sport apps. There's only one thing to do; 'pin' Freeview Play to the Home page, which means going back to the Apps page where it's hosted, and pressing the option key on the remote. On that Apps page are 18 apps pre-installed, including Amazon and Netflix (both 4K HDR-ready thanks to HEVC decoding), YouTube (complete with VP9 decoding for 4K streaming), AccuWeather, Wuaki.tv, Chilli Cinema, and everything within Freeview Play. There are also a couple of TV utilities, including a Firefox browser (naturally), a calendar, a link to the Apps market for more downloads, and a shortcut to any TV programmes recorded from the digital TV tuner to an attached, formatted HDD. The 40DX600 is very well connected. On a side-panel (to the TV's left-hand side as you look at it) are a couple of USB slots, an HDMI input, a headphones jack and a Common Interface slot. Nearby, though rear-facing, are analogue inputs for component video (which were supposed to have disappeared from TVs by now) and two left/right phonos. Underneath, and down-facing, are a couple of HDCP 2.2-ready HDMI inputs, an optical digital audio output, a RF in for tuning Freeview HD channels, and a wired LAN slot (though the 40DX600 also includes WiFi). The TX-40DX600 (£599) is part of Panasonic's DX600 Series, which is actually rock-bottom of its five-way 4K TV line-up. It's also sold as the 49-inch 49DX600 (£799) and the 55-inch 55DX600 (£999), which makes the 40DX600 alarmingly smaller than its 4K stablemates. However, both of those larger versions have IPS panels, which tend to lack contrast, so perhaps the VA panel-endowed 40DX600 does have an advantage despite its size. Go up a peg to the DX650 Series and you get 10,000 Hz scanning and a new design, and a step further to the DX700 and Panasonic TX-DX750 Series for HDR. However, there's a long drop to the next DS500 Series, which lacks even 4K resolution.